1. How much pension do you want to have when you retire? 2. When do you plan to retire? 3. 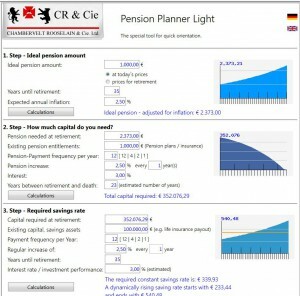 How much pension can you already expect from other pension plans or from capital/assets you have built up in the past? It is hopefully self-explanatory enough so that you can work things out yourself. If you would like our assistance or are not sure what to fill in where, do not hesitate to contact us – we are happy to help you!